You may have noticed that most of these books will be found in your Children’s and Teen collections. Historically, materials for children and teens have always had a healthy presence on the Banned Books Top Ten lists. It’s easy to imagine concerned adults making complaints on behalf of children (whether the kid knew it or not). Perhaps, those concerned adults don’t even realize that what they are doing is censorship. Librarians to the rescue! 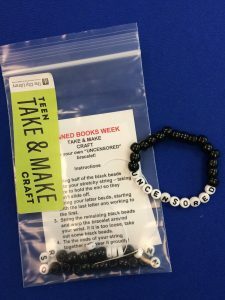 Teens at the Day-Riverside Branch of the Salt Lake City Public Library can pick up these Take & Make packets. Packets include materials for an “UNCENSORED” bracelet, information about censorship, and a list of the 2016 Top Ten Most Challenged books. Banned Books Week is a time to celebrate intellectual freedom and use library programming for targeted advocacy. Earlier this month, Alyson Feldman-Pitch shared some great ideas about programs to celebrate Banned Books Week. Over here at my library, we are hosting discussion groups for adults, providing take and makes for teens, and hosting a photo booth during Banned Books Week. Yet, how, as children’s and youth services specialists, are we engaging individual concerned adults in conversations about censorship? I personally find it much easier to talk to kids about censorship than adults. Kids seem to understand more keenly than adults what it feels like to be told “no,” “don’t”, or can’t” and they easily accept censorship as wrong! But talking to a concerned parent–oof, that’s a tough one. What are your tips and tricks? Share them below! More information about Banned Books Week and support for those facing materials challenges can be found on the Office of Intellectual Freedom site.